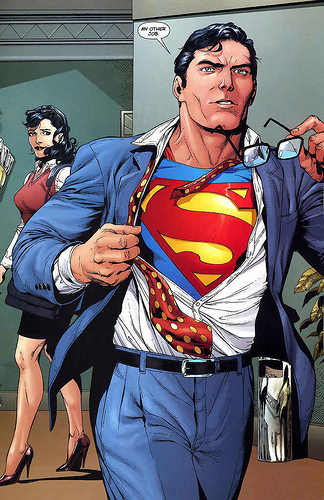 MEDIA ROOTS – Standing for “truth, justice, and the American way” just took a giant leap into the twenty-first century with Clark Kent leaving the Daily Planet newspaper. In next week’s issue, to be released by DC Comics, Clark is expected to stand up in front of staff and mourn how mainstream “journalism has given way to entertainment,” according to the comic’s writer Scott Lobdell. He continues to explain how the superhero’s alter ego will now “start speaking an unvarnished truth” possibly by creating an independent outlet similar to that of Drudge Report. This could be a huge, albeit indirect, opportunity to support independent news outlets such as Media Roots. Or it could be just another way for the establishment to mislead the public into thinking comic books will become a new frontier for reliable information. A current example of how the corporate entertainment industry poses as a source for reliable news is The Daily Show, whose host is one of the twenty most influential media personalities now influencing this year’s presidential election. Clark’s decision is still worthy of note in that a fictional superhero is acting on a crisis that is affecting the citizenry every day. This is not the first time in recent history that Superman has stood up for contemporary political issues. Just last year, he threatened to renounce his U.S. citizenship before the United Nations because of he was tired of his “actions being construed as instruments of U.S. policy.” While he didn’t actually renounce, the episode created heated discussion among both supporters and dissenters of America’s modern role in the global community. The depth of Clark Kent’s future investigations will ultimately underscore this impact on modern society. Will he highlight the numerous questions that still surround 9/11 or feature Obama’s current war on investigative journalists? Possibly he will investigate the role hedge funds have played in the still-occurring financial collapse. Only time will tell, hopefully before it’s too late. Oskar Mosco for Media Roots. Image provided by Flickr user istolethetv. Lois Lane ain’t got nothing on Abby Martin!